To purchase the Trumpeter 1/350 scale USS Franklin scale model manual on printed paper click this PAYPAL button. 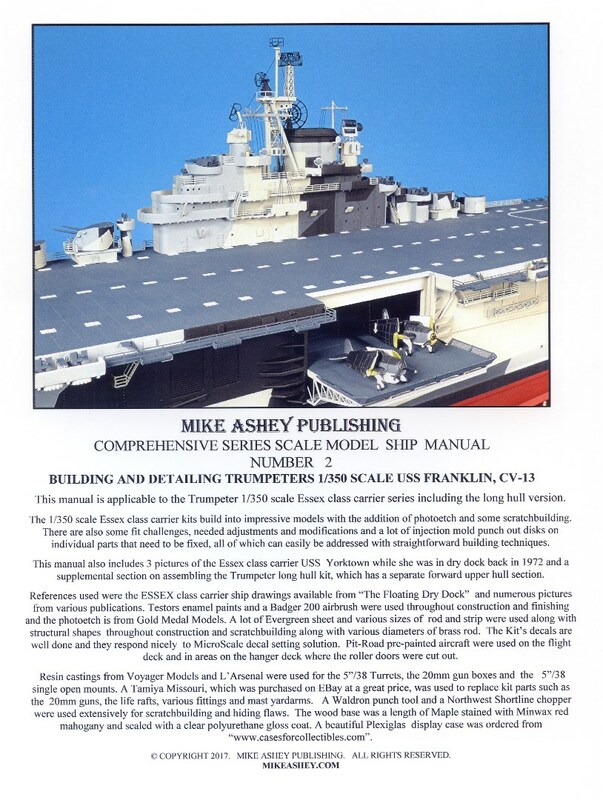 To purchase the Trumpeter 1/350 scale USS Franklin scale model manual PDF click this PAYPAL button. This comprehensive series manual shows you how to build a more accurate 1/350 scale Essex Class carrier by adding scratchbuilt parts such as the external hull piping. A specific construction sequence is presented which shows you how to modify and adjust parts for a better fit and how do deal with seams and imperfections in hard to reach places. Gold Medal Models brass photoetch detail sets are also integrated into the construction and detailing of the kit and specific construction tips demonstrate how to make the photoetch assemblies stronger. Resin detail sets such as Voyager Models and L’Arsenal Models are also included in the construction sequences of the manual. Step by step painting sequences for achieving a perfect dazzle pattern for the USS Franklin is also provided. Pit-Road pre-painted aircraft are used and the manual includes tips on constructing jigs for positioning the separate outer wings. The manual also demonstrates how to assemble the long hull kit so that the decking will fit properly while also filling the vertical gaps between the separate hull sections.